W Blade-80 has an 80 ounce face weight, and the blade is 1 5/8” in height. The color is an olive/emerald blend with brown/green thatch. The W Blade is an engineered blade with KoolMax technology – it is designed to reflect sunlight and retain moisture, which keeps it 15 – 20 degrees cooler than other turfs. This product is one of our top sellers as not only does it look natural, but it is cooler than most turfs and the W Blade is also a Performance Series blade, designed for high traffic. Many people wish to create a lawn that matches their vision of a dream home. They don’t always achieve that goal, because lawn care can be costly. 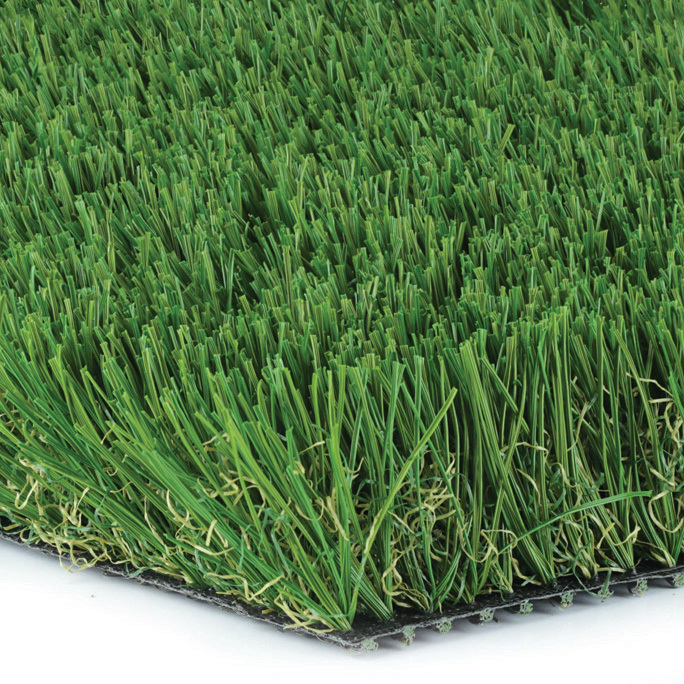 With the W Blade-80, our artificial grass for residential and commercial use, that’s not an issue. The color, an olive/emerald blend, looks the same all year long. This allows you to explore many landscape design ideas. You don’t have to worry about how weather throughout the seasons will affect the look of the design. Instead, it will always look exactly as you did when you installed it. This commercial synthetic grass’ blades are shaped to reflect sunlight and keep in moisture. On top of that, it’s non-toxic and lead-free. Along with that, the cushion of its 80 ounce face weight makes it ideal for parks and playgrounds. The added cushioning keeps kids, pets, and athletes safe should they ever take a fall. It’s a perfect option for saving money, staying safe, and catching the eye. Enjoying a safe and comfortable lawn is easy and affordable with residential artificial grass and commercial synthetic grass from Watersavers Turf. See for yourself with free 1’ x 1’ samples, available at all Watersavers Turf locations. If you don’t live nearby, we’ll ship the samples right to you.